The Florida Skin Divers Association (FSDA) invites ALL DIVERS & ANGLERS to join in the removal of Lionfish (Pterois volitans) on Florida’s West Central Gulfcoast. This one-day event will be held at the Belleair Boat Ramp located at 3900 W. Bay Dr., Belleair Bluffs, FL 34640, on Saturday May 19, 2018. Rain date for this event is on Saturday July 28th, 2018. This will be a one-day event. Diving will be on Saturday, May 19, 2018. Divers may enter the water at 7:00 AM. At least one participant from each team must be in the weigh-in line, with their fish, at Belleair Boat Ramp by 6:00 PM on Saturday, May 19, 2018. This is a team event, teams can consist of 1 - 4 divers per team. To save time and expedite the weigh-in line, we WILL NOT be weighing each individual fish. It will be the participants responsibility to set aside their largest and smallest entry for weigh-in. 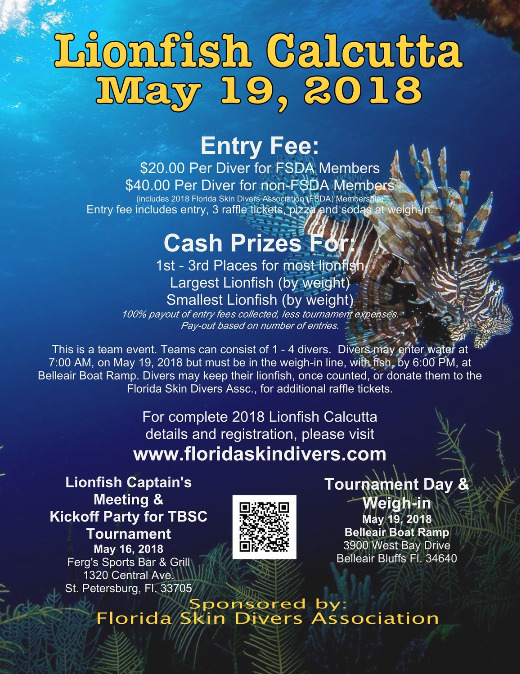 Please refer to the "2018 Lionfish Calcutta Rules / Waiver" for complete tournament information. Participant’s not in line with their fish by 6:00PM will be disqualified. Attendance at the Captain's Meeting is not mandatory. Cash prizes will be based on entry fees collected less tournament expenses. Participants may keep their lionfish or donate them to the FSDA for additional raffle tickets. For complete tournament details and registration form, please click the link below. Completed entry form and waiver must be faxed, emailed or mailed to complete registration. 9385 C Bay Pines Blvd.